Add the fun of face painting or glitter tattoo body art to your next party. Superheroes, monsters, princesses, tigers, butterflies and more! 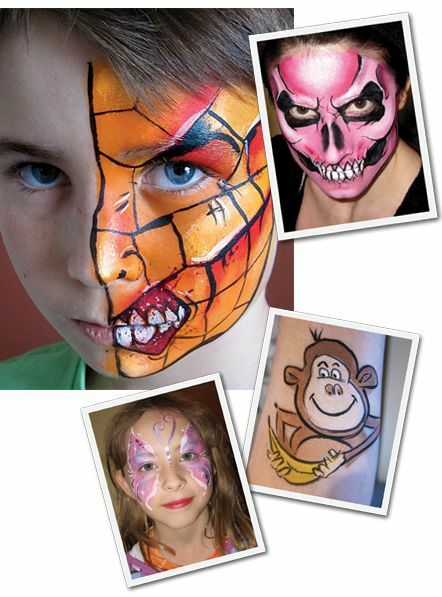 Face painting is ideal for birthday parties, halloween parties and even adult get togethers – whether it be to keep the kiddies entertained or for the ‘big kids’ to get some bling! Parties are booked by the hour, please email for pricing. Travel charges may apply to trips of more than 25 km. Always sure to draw a crowd! Booking face painting for your event or festival booth is a great way to draw a crowd and be remembered. I have been painting at fairs and festivals since 2006 – I LOVE the energy of large events and meeting local families. Call me to book face painting for your corporate and community events, street festivals, fundraisers, seasonal events and more. Flat rate bookings, Pay Per Face, and crowd-funded booking plans available. A few places you may have spotted me! and countless WONDERFUL birthday parties!